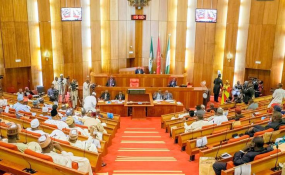 Following the current hardship being experienced in the country occasioned by the ongoing economic recession, the National Assembly has said that a total of eight bills already passed were on hand to be forwarded to President Muhammadu Buhari for presidential assent. Special Adviser to the Senate President, Bukola Saraki, on Media and Publicity, Yusuph Olaniyonu, who disclosed this in a statement, Monday, said the eight passed passed bills were received from the House of Representatives by the Senate for concurrence and onward presentation to the president. "The Bills, which are aimed at strengthening the laws of the Federal Republic, were considered and passed in a single sitting of the Senate - demonstrating commitment to employing all legislative mechanisms at its disposal to end the current economic recession in the country, "the statement said. The statement added:" The Bills that will be presented to the President soon include the Telecommunication and Postal Offences Act (Amendment) Bill, National Crop Varieties, Livestock Breeds (Registration) Act (Amendment) Bill, Produce (Enforcement of Export Standards) Act (Amendment) Bill, Prevention of Crimes Act (Amendment) Bill, Water Resources Act (Amendment) Bill, National Agricultural Land Development Authority Act (Amendment) Bill, Bee (Import Control and Management) Act (Amendment) Bill and Agricultural and Rural Management Training Act (Amendment) Bill." The statement emphasised the importance of the Bills in ending Nigeria's economic contraction and stated that the Bills will be promptly forwarded to President Muhammadu Buhari for his signature. "By now it is clear that the Senators take Nigeria' economic situation very seriously," he said, "If you recall, one of the points from the 21-point resolution passed by the Senate on the economy stated that it would fast-track all economic related bills. What this Senate has done is match its words with its actions." "The eight Bills, which are all primarily amendments to existing laws, are aimed at strengthening the enforcement mechanisms in sectors of the economy that can help boost Internally Generated Revenue. "Important highlights of the Bills include the amendment to the Telecommunication and Postal Offences Act, which is aimed at increasing some of the prescribed penalties, fines and compensations for non-compliance with the Act. This is intended to help boost investment and participation in the telecommunications sector. "Additionally, the National Crop Varieties, Livestock Breeds (Registration) Act (Amendment) Bill, Produce (Enforcement of Export Standards) Act (Amendment) Bill, National Agricultural Land Development Authority Act (Amendment) Bill, Bee (Import Control and Management) Act (Amendment) Bill, and the Agricultural and Rural Management Training Act (Amendment) Bill are all aimed at bolstering the standards in Nigeria's Agricultural sector to help the country achieve more economic diversification, "it further stated. Meanwhile, the Senate President, who is the Chairman of the National Assembly, has stated that the eight bills will be promptly forwarded to the president for assent. "Moving forward, Nigerians can expect that the legislature will adopt a united and efficient approach to getting Nigeria's economy back on track," Saraki stated, "We will quickly forward these 8 Bills, which have been passed by both Houses of the National Assembly to the President. This is only a first step and we will continue to work to ensure that at the end of our tenure, Nigerians will see that this is a people-centred National Assembly, "he said.